Looking for an outdoor volunteer position? 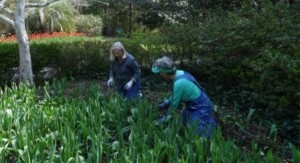 Airlie’s grounds volunteers gather on Thursday mornings at 9:00am in the Garden Services Center of Airlie Gardens. Volunteers are led out in to the garden to perform a variety of gardening tasks including planting, weeding, mulching, vine-pulling, and dead-heading of plants, and are appropriately nicknamed the “Dirty Dozen.” An Airlie staff groundskeeper always accompanies the volunteers. New volunteers are encouraged to come on Thursday mornings with garden gloves and a kneepad, also a spade or soil knife if readily available to you. Airlie provides all other tools. From week to week there are about 6-12 volunteers that gather, and there is always room for more! Airlie can also arrange other dates and times for those who may not be available on Thursdays. Most grounds volunteering is done during the week only (M-F). Volunteering in the garden is a great way to learn more about southern agriculture and meet new people! To fill out a volunteer application, click here.